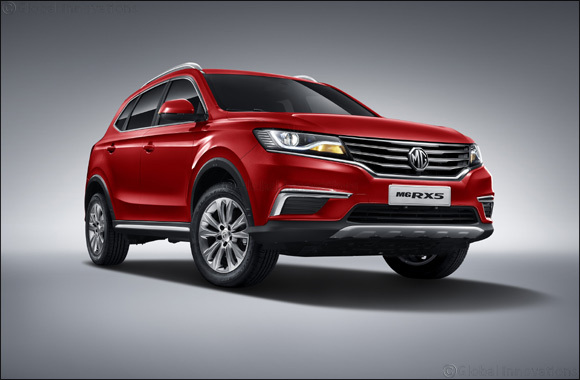 Jeddah, Saudi Arabia, 13th December 2017: MG Motor has announced that it will showcase its new RX5 compact SUV for the first time in the Middle East at this year’s Saudi International Motor Show (17-21 December). The launch of the RX5, which encapsulates the famous British brand’s exciting future, coincides with the company’s debut at this important automotive extravaganza. The RX5 will be the latest model to join MG’s exciting range of cutting-edge vehicles. It boasts an attractive, futuristic design, exemplified by the stylish LED headlamps and imposing front grille. Inside the cabin a high quality finish complements the quietness of the ride, while best-in-class space ensures equally high comfort levels and owners will also benefit from a range of the latest technological features. Power is derived from a choice of two turbocharged engines. Both 2.0T and 1.5T units deliver impressive performance and efficiency, and are mated to six and seven-speed transmissions respectively. Great performance isn’t compromised when it comes to safety, with the RX5 offering a wide range of passive and active safety measures. The RX5 will be joined on the MG stand by the ZS crossover, another new model that marks an exciting new era of design for the iconic brand and which will be making its regional show debut in Jeddah. Based on ‘Emotional Dynamism’, the MG ZS embodies a more expressive design language that emphasises the premium experience and commitment to quality of the ambitious brand. Commitment to design excellence is continued in the interior of the MG ZS, with touches that nod to a dynamic and exclusive space for the driver, while being accessible and user-friendly for any passengers. The interior features soft materials with a colour contrast from the dark grey base to create a layered effect. A trend for ‘bigger’ connectivity means 8” infotainment screens will become a signature of MG going forward, as it looks to target a younger generation. The presence of MG, which is owned by SAIC Motor, at the Saudi International Motor Show follows the recent announcement of the brand’s return to the Kingdom as it accelerates the expansion of its new product lineup. MG’s first Saudi showroom, on Madina Road in Jeddah, was opened in November in collaboration with the company’s Saudi retail partner, Taajeer Group.